Now available for pre-order: a new album from Industrial Jazz Group leader Andrew Durkin. Check out the free streaming track, "Flower Gun Song." 2 years 4 months ago. The 10-piece edition of the IJG, returning to SoCal in March 2015 (in other words, IT'S ABOUT TIME). Dates/venues TBA. 4 years 3 months ago. Prepping some music for the amazing Quadraphonnes, who will be performing with me at Town Hall in Seattle next week. Saxophone quartet = one of my favorite musical configurations. 4 years 5 months ago. Hello Fellow Musicians, love your noise. This is our take on Industrial Jazz: http://youtu.be/Jt1bbR-Dtdg 5 years 2 weeks ago. Very excited to record some sax tracks this Friday with PDX saxophonists David Valdez and Tim Willcox -- for a sextet side-project that was rudely interrupted nearly two years ago. Really proud of this music, and looking forward to getting it out into the world soon. 5 years 2 months ago. The group name is only misleading if it leaves you expecting full-on metallurgical ugliness instead of machine-tooled modern jazz compositions of exquisite precision and strong aesthetic appeal. Outstanding soloists- saxophonist Beth Schenck and trumpeter Phil Rodriguez- and a crisp, punchy ensemble sound anchored on bassist Aaron Cohen and drummer Aaron Mclendon. This is the fourth release (2nd for Innova) from this incredibly cool progressive/chamber/jazz unit from California, I believe... All horns and rhythm team with no guitar! Andrew runs a tight ship and writes layers of intricate lines for his impressive six person horn team, giving each player a chance to solo over the intricate, interlocking parts. In some ways this is similar to Zappa's 'Grand Wazoo', but without the guitar or quick-changing complexities, yet still retaining with that wacky humor which is never forced. The strong point here is Andrew's rich writing for those layers of contrapuntal horns, at times it is only flute, sax and clarinet that we hear, used just right with equally strong harmonies for the trumpets and trombone. What is interesting is that this music is really in between categories, although it does use elements of modern jazz, chamber music and other quirky elements too difficult to pigeonhole. The Industrial Jazz Group continues to fight the odds on maintaining a large band, allowing resident composer Andrew Durkin a vehicle for his imaginative flights. Drawing on an eclectic core of influences including Mingus, Zappa, Messiaen, and Giuffre, Durkin writes head-snapping charts unafraid to make bold statements and easy jokes. The Group’s all-star lineup, including Beth Schenk, Kris Tiner, Cory Wright, and Aaron Cohen, gives an enthusiastic, well-rehearsed performance, bringing Durkin’s exotic fantasies to life. The title track charges forward with cascading fanfares led by Durkin's pounding piano. The ensemble plays through variations on the theme until a time and atmosphere change conjures a straightahead groove with a quartet led by a hot blue trumpet. A brief fugue interlude leads them back to the theme and out. A bright, oddly timed amusement, “A Thousand Times No” reels and careens, growing teeth and ending with Aaron McClendon’s four-handed drum solo. A rubbery figure bounces around the horns to open “Drippy.” Sweet sax arrangements over a ska beat follow, and then the ensemble blows open. Cohen explores the bass implications, leading to a sultry tenor solo that Wright takes from comfy warm to nail gun. “Gross Fugue” opens with Beth Schenk and Evan Fronos setting flutes on baroque and beyond, the ensemble quickly joining for a punchier, brassier take. After a loose improvisational interlude, the mood changes to a languid Spanish theme with Gorrell Smith on trombone. “Little Owen” sneaks in on sly alto sax, Cohen and McClendon roiling. A blue sax arrangement augments improvising brass. After some oddly swinging transitions, the company arrives in New Orleans. The alto continues to lead until Wright takes over on tenor. A pretty flute and piano duet opens “Schwarzkopf Takes the 'C' For Flagstad.” An Ellingtonian insistence grips the group, released by a slash-and-burn Tiner solo. A torrid Eastern interlude dissolves into flutes and duck calls. A heaving groove backs more virtuoso trumpet, and a hopeful arrangement caps it. “Mamas, Don’t let Your Babies Grow Up to be Cowboy-Presidents” ends the session with a breezy blow fest. The tempo slows to reveal stately, towering horns dissolving into a trio of trumpet, alto, and piano. Durkin’s piano grows into a dominant old west saloon mode, with Smith brawling on trombone. The piece ends with a portentous minor segment. 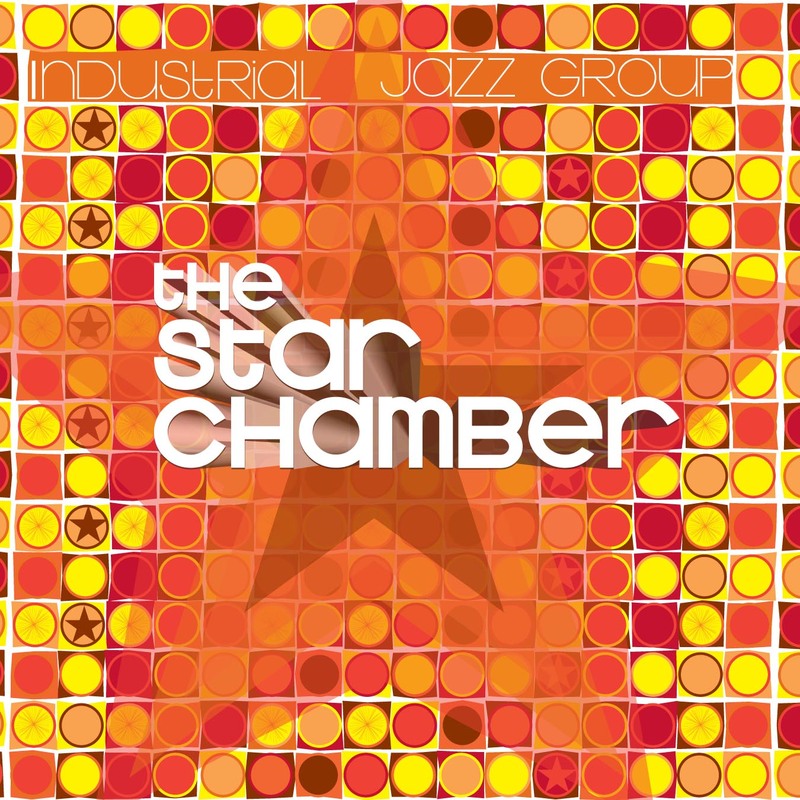 Star Chamber finds the Industrial Jazz Group energetically spreading raucous, infectious fun; this recorded performance effectively captures some of the color of their live shows.